I didn't want to throw myself into the crazy Killington early season shitshow, and I wanted to extend my streak to four straight years of skiing on natural snow in October. So I picked up a couple of girls who just wanted to go for a hike and I hit the Auto Road at Whiteface for a little low angle fun. There wasn't a lot of snow at the toll house, but we started to see snow on the sides of the road pretty quickly. 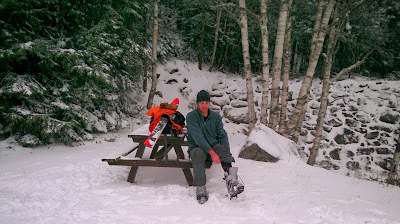 After about a mile or so, there was probably enough snow to ski on. I waited a little longer to put my skis on. I can't say enough how much I prefer this kind of skiing to the craziness at Killington or Sunday River. It was peaceful, fun, and a really good time (great company, too). Could it have used a little more pitch? Sure. But at this point in the season, I'll take what I can get. Like I said, I'm just happy to be sliding on snow again. To me, the Toll Road is the traditional start of the NY season. Dig it Matt, looks great, sooo jealous! Looks like a lot more fun than sitting in the car for 11 hours, that's for sure. Nice pilgrimage to the pow. So right about the Auto Road vs. K-Mart. I've got a birthday coming in about 10 days - may have to make my own pilgrimage then.